Welcome to Obama’s 2014 Thanksgiving for America. As reported at CNS News, nearly one in five U.S. households will celebrate Thanksgiving on food stamps this year, according to the latest data from the U.S. Department of Agriculture on participation in the Supplemental Nutrition and Assistance Program. 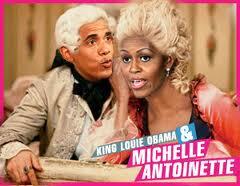 Don’t worry though, the Obama’s wont go without, let them eat cake pie. They don’t call him the Food Stamp president for nothing. But then again, he likes a government dependent class of people. As of this August, according to the most recent data released by USDA, there were 22,729,389 households on food stamps. That equaled 19.75 percent of 115,048,000 households in the country at that time. In each of the two previous fiscal years, the percentage of American households on food stamps in the average was near 20 percent, hitting 19.4 percent in 2012, 20.4 percent in 2013. As of August, according to the Department of Agriculture, there were 46,484,828 individuals in the food stamp program. Remember When Emperor Barack Obama Said He Did Not Have the Power to Take Executive Action on Immigration? “There are laws on the books that I have to enforce”. “This notion that I can change laws unilaterally is just not true”. Really Mr. President? Because last night when you announced your executive order on immigration, you pretty much did a 180 on every single previous remark you have ever made on the issue. So much for the rule of law and the US Constitution. If Barack Obama cared so much about these families and even went so far to cite scripture, why didn’t he do it sooner? Just curious, does Obama care about the American legal citizens whose families are about t be affected by this influx? How about all the people who came to the United States legally? The president will also announce plans to shift enforcement efforts, ordering federal law enforcement officers to narrow their focus to those illegal immigrants with criminal records, gang affiliations or ties to terrorism. And Obama will expand the total number of high-tech visas that are available, as well as loosen restrictions so that more would-be entrepreneurs can travel legally to the United States to launch companies. The president and other Cabinet and senior administration officials plan to “fan out” across the country over the coming weeks in order to promote the executive actions, according to one aide. The moves are all aimed at “bringing some accountability to our broken immigration system,” a senior administration official said Thursday. The biggest change to the immigration system will be a new program that allows the parents of U.S. citizens and permanent residents to apply for work permits and deferred deportation. An estimated 4 million parents will be eligible for the initiative. They are people who have been in the United States for at least five years and have no felony convictions but are currently in the country illegally. AMERICANS ARE FINALLY FED UP WITH BARACK OBAMA’S DISASTROUS PRESIDENCY … HOW’S THE “HOPEY-CHANGEY” STUFF WORKING OUT FOR YA? In the most recent NBC/WSJ poll, Barack Obama’s approval rating has hit an all-time low as only 40% approve while an overwhelming 54% disapprove. It appears the American people have finally grown weary of Obama’s disastrous presidency and 6 years into “Hope and Change,” Barack Obama has no one else left to blame but himself. He has had his opportunity to make positive change, and has only made things worse. An amazing 71% say that the country is headed in the wrong direction, while only 21% say we are on the right track. This number can be easily explained when individuals looks at the domestic and foreign policy issues and see nothing positive. The recession continues as the real unemployment rate is closer to 18%, the US debt continues to spiral out of control, median incomes are down, the US-Mexican border crisis, scandals abound and the the Middle East on the brink, failures in Iraq and Afghanistan, rise of terrorism and Obama siding with, not our allies. 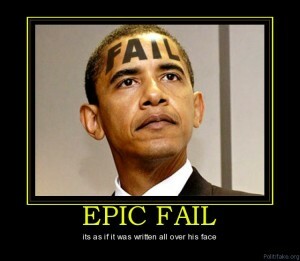 Even liberal Democrats have come to the reality that he is nothing but a liar. Six in 10 Americans are dissatisfied with the state of the U.S. economy, more than 70 percent believe the country is headed in the wrong direction, and nearly 80 percent are down on the country’s political system, according to the latest NBC News / Wall Street Journal poll. The frustration carries over to the nation’s political leaders, with President Barack Obama’s overall approval rating hitting a new low at 40 percent, and a mere 14 percent of the public giving Congress a thumbs up. What’s more, a combined 71 percent say the recession personally impacted them “a lot” or “just some,” and 64 percent say it’s still having an effect on them. 17 percent say they have a parent or a child over 21 years old living with them for financial or health reasons. 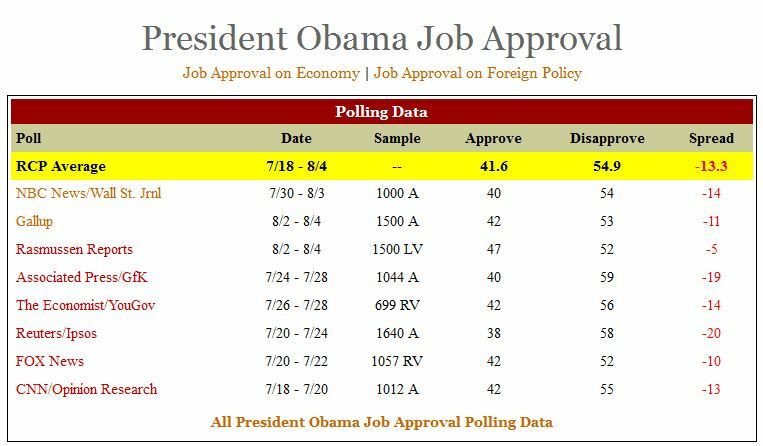 Check out the average job approval polling at RCP, if not for that bias Republican Rasmussen poll, Obama’s average approval would be at 40%.